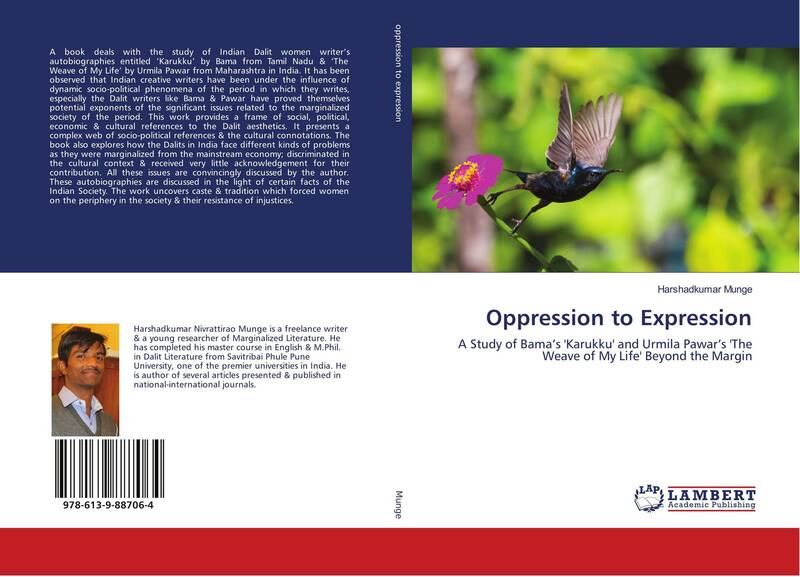 A book deals with the study of Indian Dalit women writer’s autobiographies entitled ‘Karukku’ by Bama from Tamil Nadu & ‘The Weave of My Life’ by Urmila Pawar from Maharashtra in India. It has been observed that Indian creative writers have been under the influence of dynamic socio-political phenomena of the period in which they writes, especially the Dalit writers like Bama & Pawar have proved themselves potential exponents of the significant issues related to the marginalized society of the period. This work provides a frame of social, political, economic & cultural references to the Dalit aesthetics. It presents a complex web of socio-political references & the cultural connotations. The book also explores how the Dalits in India face different kinds of problems as they were marginalized from the mainstream economy; discriminated in the cultural context & received very little acknowledgement for their contribution. All these issues are convincingly discussed by the author. These autobiographies are discussed in the light of certain facts of the Indian Society. The work uncovers caste & tradition which forced women on the periphery in the society & their resistance of injustices.